The signature insurgent weapon of Iraq and Afghanistan is proving more durable than either war. Every month, outside either the U.S. former warzone or its remaining active one, militia groups construct approximately 600 cheap, homemade bombs to hide in ditches, roadsides, culverts and vehicles — nearly twice as many as they did two years ago. That’s the latest assessment of the Pentagon’s task force to stop the bombs, known as the Joint Improvised Explosive Device Defeat Organization or JIEDDO. For the past two years, nations beyond Iraq and Afghanistan have tallied between 500 and 600 bombs per month. On any average month during that period, the bombs kill 310 people and injure 833, far from the lands that birthed the homemade bombs. That’s a new high. According to a JIEEDO report from 2010 (.pdf), insurgents outside Iraq and Afghanistan rarely constructed more than 300 bombs per month between September 2008 and September 2010. More often, the monthly bomb total hovered around 250. The improvised explosive device — a cheap family of weapons that can be built with minimal technical savvy and for less money than an iPhone — is killing and wounding more people as time goes on. Public Intelligence passes on an August report from JIEDDO collating homemade bomb data worldwide over the past two years (.pdf). By far the lion’s share of the bombs come in the Middle East and South Asia, particularly “Pakistan, Syria and Yemen,” where JIEDDO assesses the main regional threats from the bombs will remain. And the presence of the bombs there also underscores the relative lack of success Mideast and South Asian governments have in countering them: In August 2012, in the region, there were 104 bomb detonations and only 49 unexploded bomb discoveries. In Europe and Israel that same month, government forces recorded 32 bomb detonations and 21 unexploded bomb discoveries. 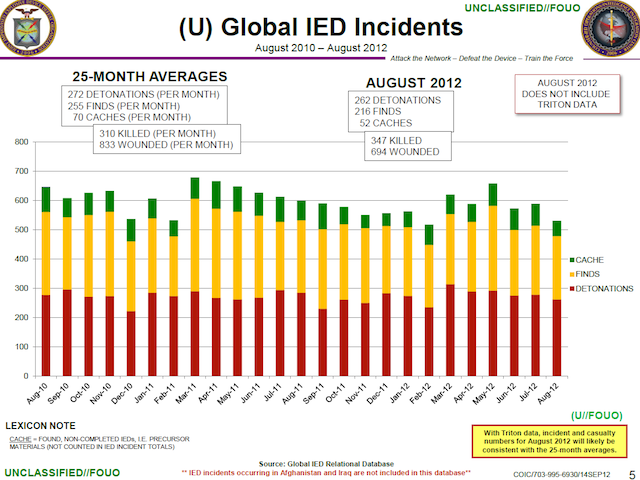 Despite years of predictions, the U.S. remains relatively spared from improvised explosive devices. In August 2012, for instance, police in Lowell, Massachusetts, investigated “explosive incidents,” one in a public park and the other near an elementary school. “Currently, there are no indications of links to any terrorist activity,” JIEDDO assesses. That was hardly a forgone conclusion: Faisal Shahzad tried and failed to explode a car bomb in Times Square two years ago; and al-Qaida in the Arabian Peninsula has since published an English-language webzine giving step-by-step lessons in homemade bomb attacks. So far, no takers. 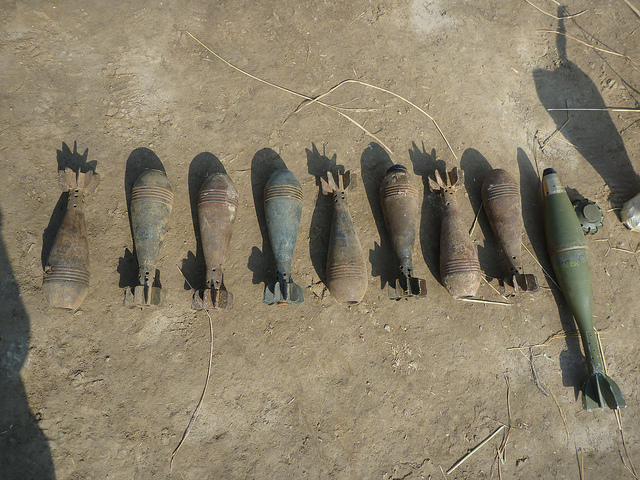 There isn’t much of a silver lining to the spread of deadly bombs worldwide. But to the extent there is, it’s this: Only about half of them successfully detonate. Alas, that’s about twice the rate of bomb success that the U.S. confronts in Afghanistan — perhaps pointing to foreign markets for all the anti-bomb tech the U.S. has labored to create and purchase in the decade of the homemade bomb.